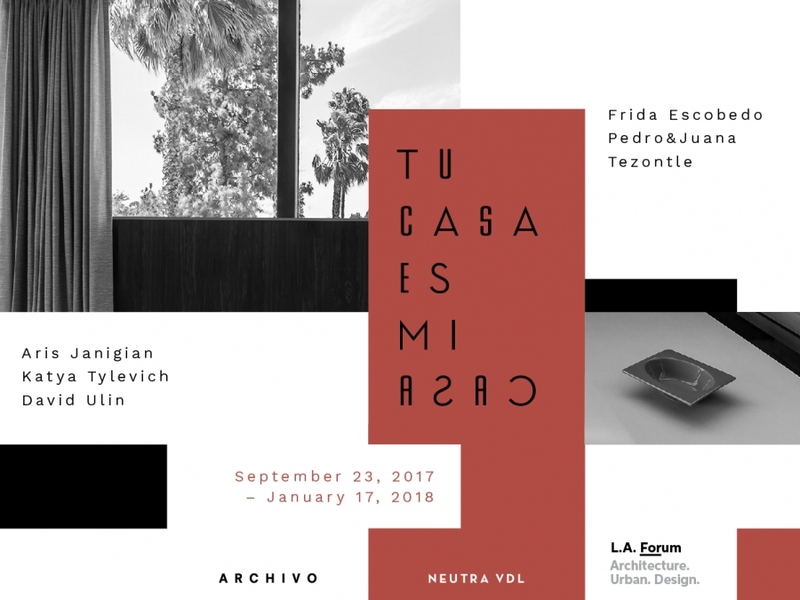 The Los Angeles Forum for Architecture and Urban Design, Archivo Diseño y Arquitectura, and the Neutra VDL Studio and Residences have come together in collaboration to present Tu casa es mi casa, an exhibition that connects two modernist houses in Los Angeles and Mexico City via the exchange of texts, objects, and installations by contemporary writers and architects/artists. Three California-based writers— Aris Janigian, Katya Tylevich, and David Ulin —were asked to craft a letter to one of the three Mexico City–based design teams— Frida Escobedo, Pedro&Juana, and Tezontle, who responded with site-specific installations at the Neutra VDL House. Tu casa es mi casa is supported by the Graham Foundation for Advanced Studies in the Fine Arts, the Los Angeles Department of Cultural Affairs, Cal Poly Pomona Foundation, Crosby Doe Associates / Architecture for Sale Magazine, Bestor Architecture, Michael Maltzan Architects, NAC Architecture, TEN Arquitectos with additional support from Aesop, Bar Keeper and Mezcal Union, Triview Glass Industries LLC, Cal Poly Pomona Department of Architecture (CPP ARC), Sci­Arc, USC School of Architecture, and Woodbury University School of Architecture. Time and locations to be confirmed. Frida Escobedo founded her practice in 2006. From 2003 to 2006 she was co-director of the architectural firm Perro Rojo. Her work has focused mainly on reactivating urban spaces that are considered to be residual or forgotten, through focal projects that range from housing and community centers to hotels and gallery spaces. This particular interest has extended to her work at Universidad Iberoamericana and Universidad Anahuac, where she teaches two studios centered around housing in residual or under-utilized urban areas. She has been invited as juror for studio final presentation at Harvard Graduate School of Design, Boston College of Architecture and TEC de Monterrey Campus Querétaro. The work of Frida Escobedo has been published and presented — both in exhibitions and lectures — nationally and internationally. In 2009 she was winner of the Young Architects Forum, organized by the Architectural League of New York. In 2004 she was awarded with the Scholarship for Young Creators by the National Fund for Arts and Culture (FONCA) and in 2008 she was selected by the Swiss office Herzog & De Meuron to participate as one of the architectural studios to build a villa for the Ordos 100 Project in Inner Mongolia, China. In 2012 her work was presented in the Mexican Pavilion at the Architecture Biennial in Venice and the Mission Cultural Center for Latino Arts, in San Francisco. Also in 2012, she was invited to participate in a collective exhibition in Storefront for Art and Architecture in New York and she presented her first solo exhibition at LIGA in Mexico City. In 2013, she was selected as one of the three finalists for the Architecture program at the Rolex Mentor and Protégé Arts Initiative and was nominated for the Arc Vision Prize for Women and the Iakov Chernikhov Prize. In 2014, she was selected as one of the finalists for the Designs of the Year at the Design Museum in London and was nominated for the Mies Crown Hall Americas Prize of the Illinois Institute of Technology. The same year she was invited to participate in the Swiss Pavilion of the Venice Architecture Biennale. Recently, she won the Ibero-american Biennale of Architecture and Urbanism Prize(IX BIAU) celebrated in Rosario, Argentina. Pedro&Juana is a studio from Mexico City founded by Ana Paula Ruiz Galindo and Mecky Reuss that works on a variety of projects across creative professions. Some of them are: Dear Randolph (2015), a domestic interior public square for the 2015 Chicago Architecture Biennial, The State of the Art of Architecture, composed of moving lamps, rockers, tall and not so tall tables and some wall tapestry. Pavilion Of Hotel Palenque Is Not In Yucatan (2014), a pavilion within an exhibition that served as the site for the symposium The Future Curatorial What Not & Study What? Conundrum, and which hosted a Little Pig Session (Sesiones Puerquito 2012-2015), cooking a suckling as pretext for better conversation. Archivo Pavilion (2012), an intervention in the gardens of Archivo Diseño y Arquitectura DF/Mexico. Hellmut (2013) a Table turn Bench turn Table for Gallery 1 of Museo Jumex DF/Mexico. Casa Reyes (2011-2012) an annex in an ex-colonial house in Merida/Yucatan. Cocina DS (2013), a kitchenette entrance for Dorothea Schlueter Galerie in Hamburg/Germany. Tezontle identifies with Mexico’s pre-hispanic heritage and the abstract work of the Mexican modernists of the mid-20th Century. The studio works by curating found objects with self-made ones in a process of generating innovative formal and material narratives. This working method is independent of scale. When scale becomes irrelevant, the sculptural becomes the architectural and vice versa. Amongst other projects Tezontle is currently working on a variety of small scale sculpture commissions, including a mixed use sculptural garden in the caribbean town of Tulum and the museography for Archivo’s MXCD:02 exhibition about Mexico City’s history through objects that will open in October 2017 and a set of concrete living units designed along Bahia de Guadalupe in the coast of Guerrero. Carlos and Lucas also teach. They are co-founders of the Architectural Association’s experimental concrete workshop AAVS Las Pozas that takes place every summer in the Huasteca Jungle and serves as a research platform that aims to forge links between craft and culture in the town of Xilitla. Aris Janigian is author of four novels, Bloodvine, Riverbig, This Angelic Land, and his most recent, Waiting for Lipchitz at Chateau Marmont, a Los Angeles Times bestseller. He is also coauthor along with April Greiman of Something from Nothing , a book on the philosophy of graphic design. A PhD in psychology, from 1993 to 2005 he was senior professor of humanities at Southern California Institute of Architecture. He has published in genres as diverse as poetry, social psychology, and design criticism. He was a contributing writer to West, the Los Angeles Times Sunday Magazine , a finalist for the William Saroyan Fiction Prize, and the recipient of the Anahid Literary Award from Columbia University. Katya Tylevich is a writer and essayist. She is coauthor of the book My Life as a Work of Art (Laurence King, 2016) with Ben Eastham. She is editor-at-large for Elephant, contributing editor for Mark, and regular contributor to Domus, Pin-Up, and Frame, among other journals. Her writing appears in books, monographs, and exhibition catalogues on topics in art and architecture, including Todd Hido’s Excerpts from Silver Meadows and Michaël Borremans’ As Sweet as It Gets . With her brother Alexei, she is cofounder of Friend & Colleague, a platform for editions, fiction and special projects. David Ulin is a book critic, and former book editor, of the Los Angeles Times . He is a 2015 Guggenheim Fellow and is the author of Sidewalking: Coming to Terms with Los Angeles. His other books include The Lost Art of Reading: Why Books Matter in a Distracted Time and The Myth of Solid Ground: Earthquakes, Prediction, and the Fault Line Between Reason and Faith. He has edited two collections of Southern California literature: Another City: Writing from Los Angeles and Writing Los Angeles: A Literary Anthology, which won a California Book Award. Ulin’s work has appeared in The Atlantic Monthly, The Nation, New York Times Book Review, Black Clock, Bookforum, Columbia Journalism Review, and on National Public Radio’s All Things Considered . He teaches in the Creative Writing Program at the University of California, Riverside, and in the Professional Writing Program at the University of Southern California. Andrea Dietz is an associate with Chu + Gooding Architects, a Los Angeles-based practice with expertise in exhibition design. She has a background in cross-border exhibition and event production (with Estudio Teddy Cruz), and is a longtime associate of the Woodbury School of Architecture, where she coordinated a multi-million dollar federal grant, led graduate program curriculum development, oversaw digital fabrication facility improvements and operations, and delivered coursework in research methodologies and theory. She occasionally freelances as a curator, designer, writer, and studio instructor (with Cal Poly Pomona) and is a board member of the Los Angeles Forum for Architecture and Urban Design. Sarah Lorenzen, AIA is resident director of the Neutra VDL Studio and Residences, architecture professor, and former chair, at Cal Poly Pomona, and partner at TOLO Architecture (previously Peter Tolkin Architecture). Having spent her first eighteen years in Mexico City, as the daughter of U.S. nationals, she is keenly aware of cross-border politics. At 18 she left Mexico to attend college in the U.S. to pursue a BFA in Drawing at Smith College and the Atlanta College of Art. After graduating art school she broadened her interest to architecture, receiving an MArch I from Georgia Institute of Technology and later an MArch II MR+D from SCI-ARC. Archivo was founded in 2012 by architect Fernando Romero and his wife Soumaya Slim as a space dedicated to collecting, exhibiting and rethinking design in its various forms. Archivo is is housed in a remarkable mid-century modern house built by artist and architect Arturo Chávez Paz, neighboring Luis Barragán’s own UNESCO World Heritage house and studio, in the traditional Tacubaya neighborhood of Mexico City. Archivo is centred around a design study collection, consisting of over 1,500 design objects that cover a broad spectrum: from everyday objects of Mexican popular culture to limited editions and international design icons of the twentieth and twenty-first centuries. Beyond a simple design archive, Archivo functions as an exhibition space, a meeting place, a cultural laboratory, a forum for exchange and debate, and a key element for building knowledge and a critical approach to Mexican design. The Neutra VDL Studio and Residences (1932-1965) of famed modernist architect Richard Neutra is owned by the Cal Poly Pomona Foundation (501(c)(3) tax exempt organization) and is under the stewardship of the College of Environmental Design (ENV) at Cal Poly Pomona. The primary mission of the College with respect to VDL is: to use the house as an educational resource for ENV students and faculty, to preserve and maintain the property, to make the house accessible to visitors through tours given by Cal Poly Pomona architecture students, and to host arts and culture programs that will strengthen the facility’s mission as a community resource. In 2010 VDL began an exhibition program, where artists/architects/writers are invited to spend time in residence and to create in-situ installations that respond to either the house, the period in which the house was built, or the history of Richard Neutra. Previous exhibitions include: Fort Da Sampler by Santiago Borja (2010), Architectones by Xavier Veilhan (2012), Inverting Neutra by Bryony Roberts (2013), Competing Utopias a collaboration between the Wende Museum and the VDL House (2014), Wet Horizons by Luis Callejas (2015), and Cornerstone by Les Frères Chapuisat (2016-17). These installations have served to reinvigorate the house and were extremely well received by the public.